Apple cider vinegar is a non alcoholic, fermented apple juice that contains a range of vitamins and minerals beneficial to your dog's health. In addition to the wide selection of nutrients, ACV is also known to possess anti-viral, anti-bacterial and anti-fungal properties that make it a must have for anyone looking to avoid the use of antibiotics on their pets. Flea control - Dogs are man's best friend. However, it can be hard to remember this while they fill your house with unwanted fleas. Apple cider vinegar works as a powerful flea deterrent on our pets, many people claiming that simple adding ACV to their pet's food or water was another way to deter these unwanted guests. Arthritis - Apple cider vinegar is known to reduce the symptoms of arthritis in humans and dogs alike. It helps treat the problem by reducing the build-up of painful uric acid crystals in and around our joints that over time collect in small deposits, reducing our ability to move freely. Condition of coat - Want your dog's coat to shine like never before? 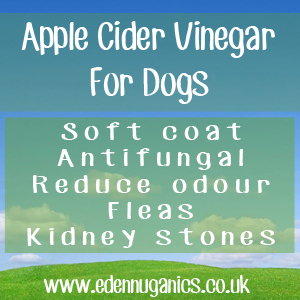 Apple cider vinegar can be applied to their fur after washing with the use of a spray bottle, this will leave your dog's fur feeling soft and help to moisturise the skin as well as avoid any fungal skin issues. Ear Infections - The powerful antiviral, antibacterial and antifungal properties of ACV make it an ideal choice when looking to treat your dog's ear infection. Using a dropper, simply add a couple of drops of raw apple cider vinegar to your dog's ear twice a day for around a week. Bladder or kidney stones - This can be a serious issue and often requires surgery. However, apple cider vinegar, when included in your dog's diet, quickly helps to break down and dissolve bladder and kidney stones whilst still in the body, allowing your pet to pass them naturally over time. Pre-biotic - A substance known as pectin, found in apple cider vinegar, acts as a pre-biotic within your dog's stomach, helping to increase the production of good bacteria while keeping unwanted yeasts and fungi in check. Digestion - Is your dog struggling with digestion? Apple cider vinegar helps to regulate levels of stomach acid in our pets, helping them to break down the food they consume more easily. ACV is also beneficial for our pets when suffering from an upset stomach and can be added to their dried food for fast acting results. Add four tablespoons of apple cider vinegar to a spray bottle with a fine mist setting and top up with eight ounces of water. Gently pull back your pets hair and spray the mixture, allowing it to reach the roots and skin. You may notice some odour at this point, but don't worry the smell will only linger on your pet for around 20 minutes. Once you have evenly coated your pet and allowed the apple cider vinegar to soak in, lightly rub down your dog using an old towel, this removes any extra liquid that hasn't been absorbed. The best way to get ACV into your dog's diet is combining it with their food or water. Apple Cider Vinegar mixes well with both wet and dry dog food and this method is easy to include in your daily routine. If your dog doesn't seem to like his food once the ACV has been added, you can consider buying ACV tablets which are easier to hide in their meals. Add a capful of ACV to your dog's water bowl once a week to reduce the risk of developing kidney or bladder stones. A little raw ACV can be mixed with your dog's food daily to help reduce parasites and lower the risk of infections. Be sure not to feed your dogs too much apple cider vinegar as it is only helpful to their health when taken in moderation. What type should I buy for my Dog? Although all apple cider vinegar can be helpful to our pets, for maximum health benefits we recommend buying a bottle of raw, unfiltered ACV as many of the cheaper bottles will have been through a pasteurization process which results in the loss of many of the healthy enzymes and nutrients.